This is such a joyous photo and it represents a decade of my life. When my eldest son Harry died in November 2000 I felt the need to channel myself into something connected with him alongside looking after my other two children Cam and Emilie. Helen & Douglas House, hospice for children and young adults, is the one of the most inspiring places and it had looked after us for many years, including respite, end of life and finally bereavement care for our remaining family. Without them we wouldn’t still be standing and I wanted to give back to the institution which had given so much to me. With my old school friend Kate Day (front left, I’m front right) I have co-produced 9 years of the Childish Things comedy show at the New Theatre, Oxford and this March sees Year 10 our final show! The shows have featured performances by Rowan Atkinson, Michael McIntyre, James Corden, Jeremy Clarkson, Miranda Hart, Steve Coogan, Rob Brydon, Jimmy Carr, Jo Brand and many, many more – in fact 89 acts have performed for us! 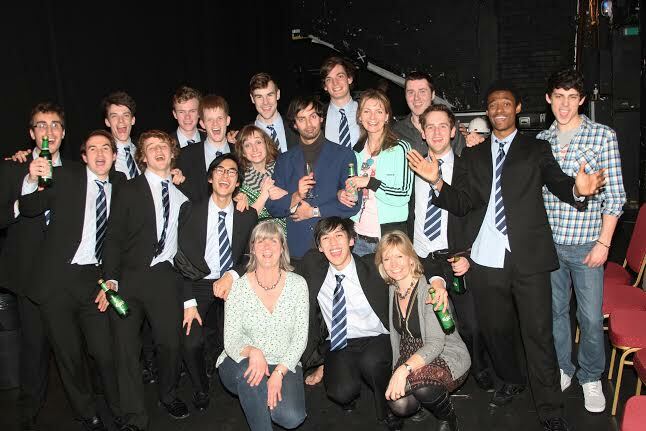 Over the years Oxford a cappella group Out of the Blue (seen in this photo) have become a regular feature and I love it when they arrive at the theatre each year with their high energy, huge talent and amazing enthusiasm and joie de vivre! They are all either studying at Oxford University or Oxford Brookes and usually take part in the group for two years with rehearsals up to three times a week and a tour of America at Easter each year. They are a tour de force and we love having them on board! Students in Out of the Blue are a similar age to many of our guests at Douglas House and it has been a great joy to introduce Out of the Blue not only to the show, but to the hospice houses and witness what a difference their music has made to the families there. Lizzie Pickering is 48 (how did that happen?) and is the co-producer of Childish Things. She still loves prancing, clubbing and karaoke and her highlight of last year was Glastonbury. She never want to miss it again. Lizzie has also loved every age and stage of family and has a secret crush on Sam Prance. In her words – who doesn’t? To book tickets for this year’s Childish Things shows on 24th and 25th March follow the link at www.helenanddouglas.org.uk. I read this article and found it very interesting, thought it might be something for you. The article is called Childish Things – #photographicmemory and is located at http://prancingthroughlife.com/2014/02/17/childish-things-photographicmemory/.